Take a breath. We have written about this several times, and each year we offer a new perspective. Do they match your goals? Residency is hard. Med students are graduating already burned out, only to discover intern year is an insane amount of work. You will not get through this three year experience because the hospital has a “Wellness Officer,” or provides free gym membership. You will survive and even thrive because the people in your program are YOUR people. This, above all else, matters. So if you met current interns and PGY2s that love silly cat stories, women’s health and hiking, and those are YOUR jam, then rank that place at the top. My co-residents are my second family, and I see them a HECK of a lot more than I see my “real” family – so they’re really my extended family. As an intern, I spent more awake hours per year with my co-residents than my husband (FYI, that definitely changed PGY2, so I’m still married. Woot). When we are not working we attempt to have brunches or dinners together. Some of us go hiking together. We’ve gone to wine tastings, Dios De Los Muertos parades, super depressing doucmentaries, etc. We have birthday parties at each other’s houses. (This year my birthday cake was picked out by another 3rd year’s 3 year old, and the amount of KitKats and M&Ms on it nearly killed me. It was amazing). I love these people, and we support each other through the ups and downs. Obviously, family is important to me, so being closer to my family matters, too. I did medical school on the eastern side of the country, but all of my family is in Arizona and California, so when rank day came the programs on the West Coast went higher. It’s made a huge difference in my life being a 2 hour drive away from my parents, and a short flight away from my brother and his family. If family is important to you, than geography is incredibly important in your rank list. You have to decide if it’s first or third in your decision tree. I knew as an applicant I wanted to be at a program that would give me support in what I was interested in, particularly adolescent health and women’s health, with full-spectrum family planning. One program I considered was at a Catholic hospital that did not allow anyone to do tubal ligations, and had no existing plan to allow for experiences with Planned Parenthood or similar. The PD assured me we could work together to ensure I’d get training, and although the program was very strong otherwise, it would not have felt right to limit the care I could provide patients, and risk not getting that training. If you are passionate about a future with a focus on a particular population (geriatrics, rural, urban underserved) or training experience (global health, family planning, c-section experience) then you must be sure you will get that experience from the program you’re committing three years of your life to. You may need to rank your goals before you can rank your programs, because no single program is likely to have everything you desire wrapped in a bow. We have old posts that cover some more ideas on that topic, but in the end go with your gut. After you’ve made those complicated spreadsheets you may look at the list and realize it ranked your heart’s #1 as #3. It’s your list, you move whichever program is YOUR best fit to #1. Just don’t do it on the last day before the rank order list is due, okay? PS: Consider getting on Twitter and following some helpful #FamilyMedicine related people. There’s a huge #MedEd community willing to answer DMs at all hours. And, just last Sunday the @WomenInMedChat focused on interviews, ERAS, etc. 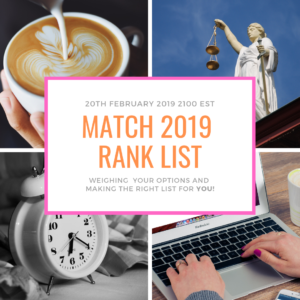 Can’t decide who to rank #1 for #Match2019? Let us help you sort it out.